Reading your gas meter is as simple as watching the mileage on your vehicle. Your meter has been equipped with an “odometer-type” index. 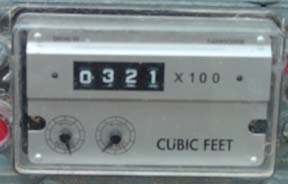 The purpose of the index is to provide the cubic footage of natural gas that has passed through your meter. There are several types of indexes, but this is the simplest to use. Looking at the above index, you can see that all the movable numbers (the white numbers on the black wheels) are all zeroes. This would indicate that no gas has passed through the meter. What it really means is that less than 100 cubic feet of gas has been used by your home. Note that the number you read is multiplied by 100 to give you the actual amount of gas used. 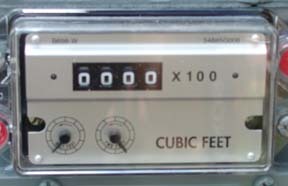 Until there is a number showing on the dials, you have used less than 100 cubic feet of gas. This index indicates that you have used more than 32,100 cubic feet, but less than 32,200 cubic feet. Generally speaking,you have used more gas than shows on your index (and on your bill). We read your meter at the same time each month to ensure that the measurement of your usage is consistent throughout the year.